How can I split a PDF's pages down the middle? 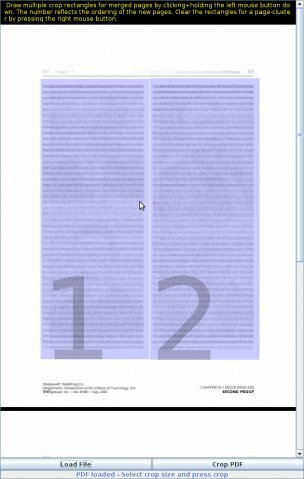 Does anyone know of a good way to split a pdf's pages down the middle into two new pages? To be clear, I'm not trying to split out already existing pages from a pdf; I am trying to create two new pages from an existing single page. It lets you split each page into as many subpages as you want by defining regions with a GUI. It groups all similar pages into groups for you, so you can define regions for that group once. It's cross-platform, free, and open-source. ...and for the fun of it, I've recently done it not with an input file featuring "double-up" pages, but one with "treble-ups". You can read the answer for this case in this other response. You want to create 1 PDF with 4 pages, each of which has the size of 421 pt x 595 pt. What did these parameters do? -o ...............: Names output file. Implicitely also uses -dBATCH -dNOPAUSE -dSAFER. -sDEVICE=pdfwrite : we want PDF as output format. -g................: sets output media size in pixels. pdfwrite's default resolution is 720 dpi. Hence multiply by 10 to get a match for PageOffset. -c "..............: asks Ghostscript to process the given PostScript code snippet just before the main input file (which needs to follow with -f). -f ...............: process this input file. Which result did the last command achieve? Done. Here is the desired result. 4 different pages, sized 421x595 pt. Thanks to @marttt and their answer in Unix & Linux. You can also use -y if you want to perform a vertical split. To expand upon @Kurt's answer (since I don't have enough reputation points to comment) first make sure the dimensions you use is not based on the Crop Box dimensions if they are different from the Media Box dimensions. The output size is based on Media Box dimensions, but the offset seems to use the Crop Box dimensions. And then stitched them with pdftk left.pdf right.pdf output final.pdf. An alternative would be to set the crop box to the same as the media box; then the offset would be -723. But then the crop would have to be reset to trim in order for the pages to appear seamless. Otherwise, set media to crop. How to convert a 1 page PDF to a 2 page per sheet PDF? How to split a PDF onto multiple pages on command line? How do I create a .PDF from selected pages of an existing .PDF? How to Split a Big Postscript file (3000 pages) into one individual file per page (using Windows 7)? How to replace a single page in a pdf using another pdf in linux? Is there any tool where I can mark the pages of a pdf to be printed when viewing the pdf? How can I print a large web page to a single-page pdf with custom dimensions? How can I split a PDF file into single pages quickly (i.e. from the Terminal command line)?